With a stay at Greentree Inn Shanghai Lianyou Road in Shanghai (Minhang), you'll be 16.1 mi (25.8 km) from Jing An Temple and 18.4 mi (29.5 km) from Jade Buddha Temple. Featured amenities include luggage storage and an elevator (lift). Free self parking is available onsite. 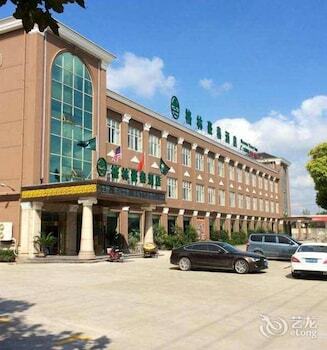 With a stay at Hanting Express Qixia Bus Station in Yantai, you'll be 25.8 mi (41.5 km) from Xianhe Park and 26.4 mi (42.5 km) from Laiyang Stadium. Free self parking is available onsite. With a stay at Chengdu Lilac Hotel Fei Cheng Branch in Chengdu (Jinjiang), you'll be a 3-minute drive from Chengdu United States Consulate and 9 minutes from Sichuan University.